Sometime last month I had made some herbed garlic butter that I so fell in love with! I used it as a filling for the garland shaped bread that I made and then I was wondering if I could use it up in something different. Since I had some boneless chicken breasts I decided to make some chicken roll ups. The idea was a hit as my son loved it. The meal was very simple in terms of taste and the presentation made sure that my son (who is a big fan of eating out) was happy too! These roll ups are really easy to make if you have some garlic butter handy. If you don’t you can still make some in a matter of minutes and you meal is ready within 30-40 minutes. So do give it a try! What I love about grilling chicken is that it helps break the weekday meal monotony (since I usually cook traditional Mangalorean food on most days) and my kids cheerfully eat it. Marinating the chicken in advance usually saves the day especially when I have tons of work scheduled. I don’t have to worry about checking on my dish every now and then as the oven takes care of it. So yeah, I’ll be trying out more such easy to make dishes and will share the recipes here on the blog. Do stay tuned! Save this recipe on Pinterest! 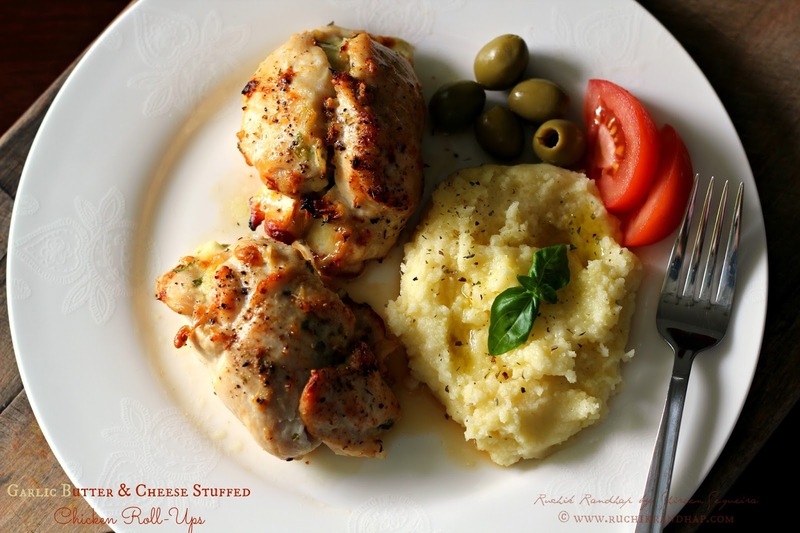 Herbed garlic butter stuffed chicken roll ups is the best way to break the monotony of your weekday meals. 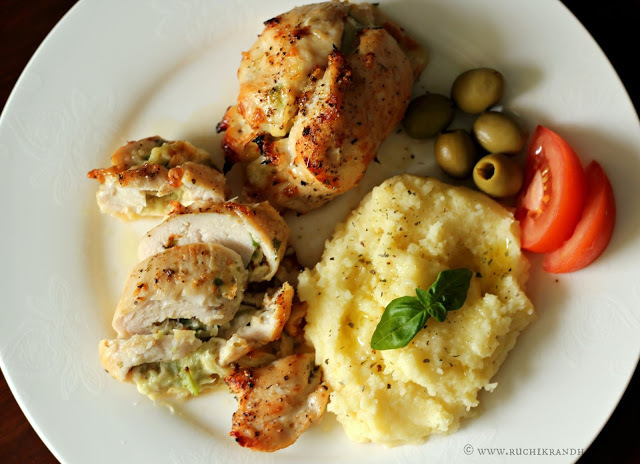 Absolutely delicious, grilled chicken is a sure winner with kids! Wash the chicken breasts and pat dry. Carefully slice them into half, horizontally so you get thinner 'sheets' of each breast piece. Marinate all the pieces lightly with salt and place them on a large baking sheet that has been lightly greased with olive oil or butter. Heat some oil in a wok/kadai and fry the chopped onions till translucent, add the minced garlic and fry on a reduced heat for a few seconds. Don't let the garlic burn or it will taste bitter. Remove the mixture onto a plate and let it cool. Sprinkle the grated cheeses and chopped coriander. Roll up the chicken from the broadest side first and secure the ends using toothpicks. Drizzle with olive oil or brush with extra butter. Preheat oven to 220 C and cook the chicken on 'bake' mode for 12 minutes. Then change the oven setting to 'grill' mode for another 8-9 minutes or till it looks golden on the surface. Remove from oven and carefully remove the toothpicks. 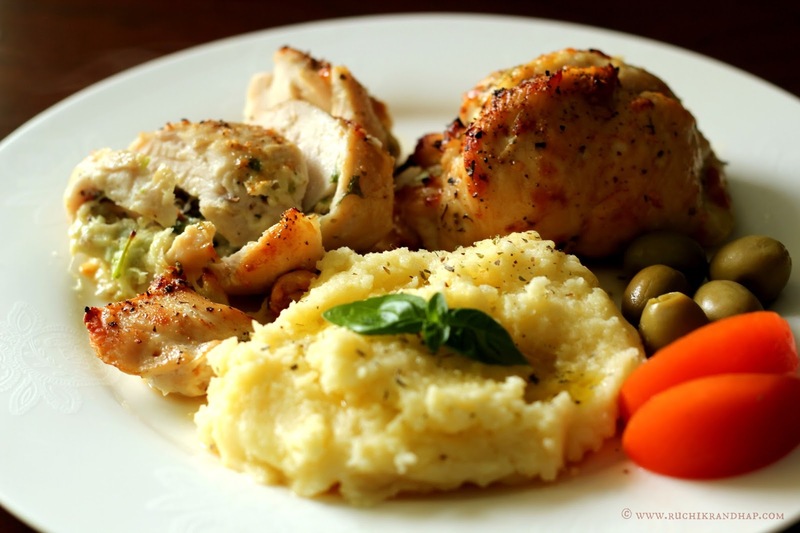 Serve hot with mashed potatoes or any side of your choice. 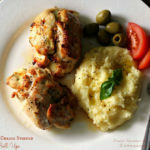 Just last week I was about to ask you if you have any recipes using boneless chicken breasts, since I didn't see any on your blog. But then I decided to try my own and came up with something similar, except instead of rolling the chicken I baked it steak style with pockets stuffed with mushroom & cheese filling and garlic butter sauce drizzled over. My kids absolutely loved it. Will definitely give your recipe a go the next time. Regarding your recipe, you have mentioned to cut the chicken horizontally, but I think you need to mention the cut has to be through the whole breast in order to get thinner slices. @ Shafe: Thanks for the suggestion! I'll update my recipe with those instructions! 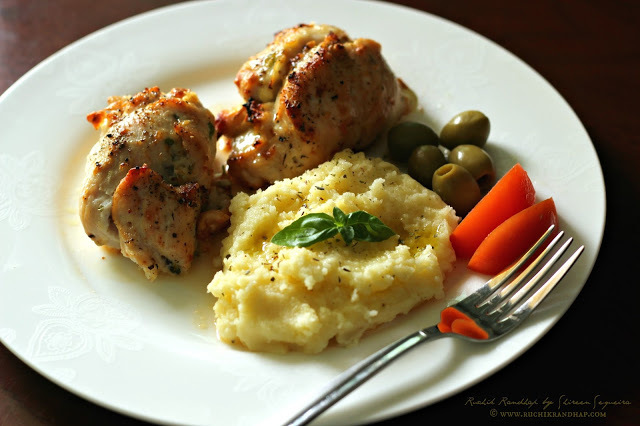 Your idea for stuffed chicken sounds divine! I hope to try that out soon!